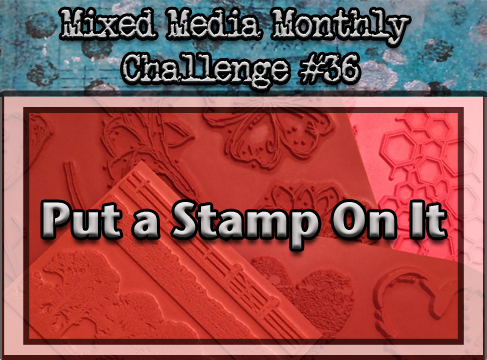 Posting my entry for the Mixed Media Challenge #36 “Put a Stamp on it” hosted by Mixed Media Monthly. Below is the image of the 4″ by 8″ canvas that I painted with Adirondack Acrylics. I then used a new brand of modeling paste (by Theresa Collins) that I picked up recently to apply texture using a stencil (dots). I really like this product; it dries quickly, applies easily and held up nicely to the multiple layers of product that I applied. This just might be my new favorite modeling paste. Next I used some Matte Mist and Glimmer mist to add some additional shine and color to the canvas. I am loving the Acrylic paint and Rubbing Alcohol technique that I have been using lately. What a fun way to add some really neat design to a project! I also thought it worked well with the circle theme I was going for on this canvas. To “Put a Stamp on it”, I used a script stamp in the back ground to add some layering/dimension and a dragonfly image as my focal point. 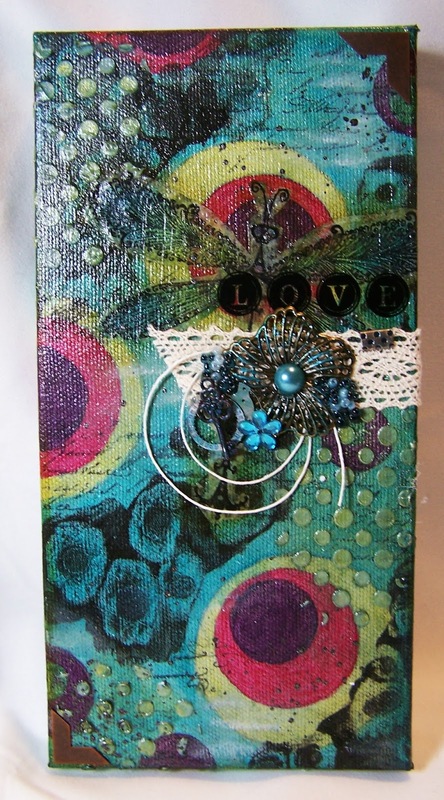 To finish, I embellished with a variety of metal pieces, beads, string and some lace ribbon. Hope you found a bit of inspiration in this piece! Sparks Acrylic Paint by Prima Marketing Inc.